Comuna 13 was formerly known as a notorious slum area with the highest murder rate in Medellin. At the time, the city itself was ranked as the murder capital of the world. 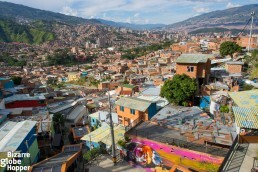 Today, Medellin’s Comuna 13 is growing its reputation around the world and its success story is imitated in troubled cities, such as Rio de Janeiro. 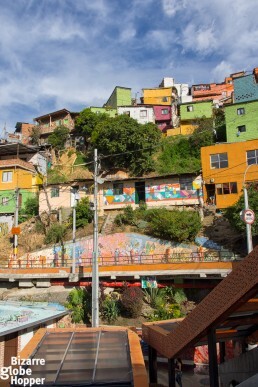 Recently, a number of Comuna 13 tours have been launched, and curious tourists are trampling the colorful streets in the steps of local guides. We decided to visit Comuna 13 independently to find out what’s it all about. Medellin’s Comuna 13 used to be controlled by gangs, paramilitary groups, and infamous drug lords. Police had no control of the area because every gang had its own lookout so that they could escape well in advance if the cops even dared to enter the neighborhood through the narrow staircases. The main highway of Medellin (San Juan Highway) penetrates the slums, lifting the cartel in charge to control all illegal import and export business of Medellin. Pablo Escobar controlled the area in the 1980s, and other gangs fought over control after his death in 1993. The murder rates in Comuna 13 tripled during 1997-2002. Police and national security forces tried to intervene violently ten times without success. In 2002, the Colombian military led a controversial Operation Orion with an ambitious goal to clean the most dangerous neighborhood in Medellin. The result? The left-wing guerrillas – FARC, ELN, and CAP ­– were removed from Comuna 13. When the army, police special forces, and air forces fought over guerrillas, 100 000 inhabitants of Comuna 13 were left in the middle of the heavy combat and siege. Innocent people, including children, were killed, injured – or officially just disappeared. 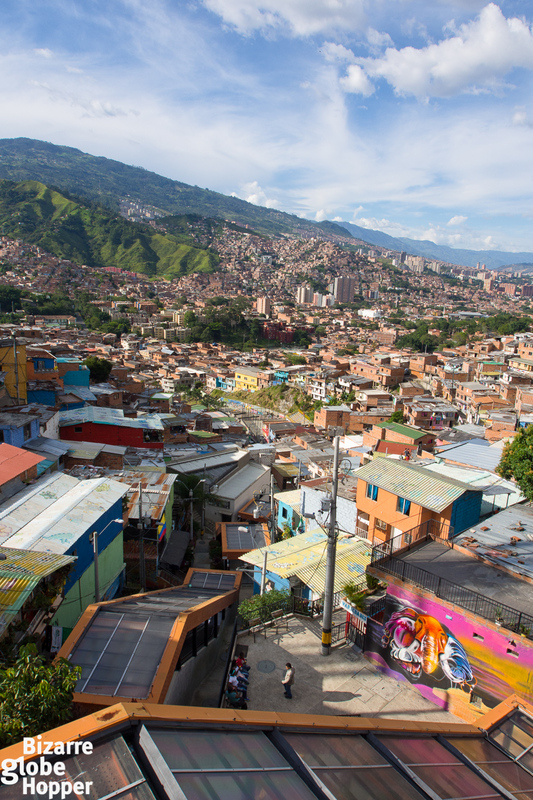 Only the masters changed: Operation Orion gave control of Comuna 13 to paramilitary groups, which led to paramilitary hegemony over the whole city of Medellin. Later, paramilitary leaders have confessed an ally with the police. What about the murder rates in Comuna 13, then? Officially, things brightened up after Operation Orion. But we were told that instead of throwing corpses to the streets, they were more discreetly carried to the dump site of La Escombrera hill. Then suddenly things started to change inside Comuna 13. Local government provided youngsters free paint to strengthen their sense of community and channel frustration into a creative force. Soon schools and shops followed their example. Then an architect suggested a creative public transport option to Comuna 13. The world’s first outdoor escalators were born to connect poor neighborhoods. Medellin’s outdoor escalators have since been copied by the several other cities, like Rio de Janeiro and Ankara. On our Comuna 13 tour, we saw beautiful murals, tons of flowers, happy faces, and hope. Though we visited Comuna 13 independently, unlike most tourists, we felt safe. 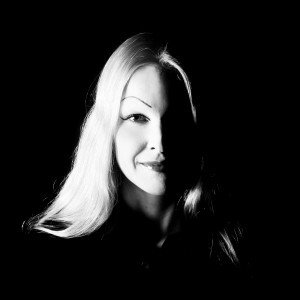 But, for sure, things aren’t that black and white. The official stories of the troubled past and current bloom of Comuna 13 seemed to be drastically different from the stories of locals. 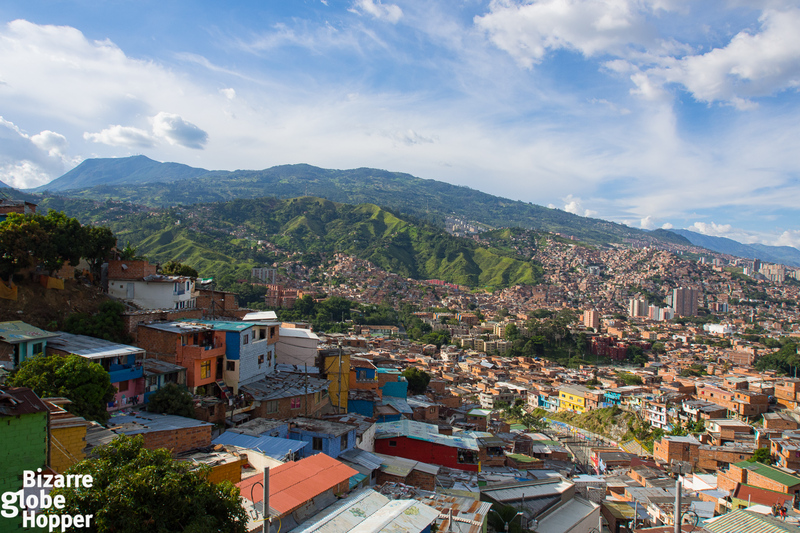 We recommend that you explore Medellin’s Comuna 13 on your own terms to draw conclusions. Medellin’s Comuna 13 is scattered upon such steep hills that it used to be accessible only by stairs. Climbing atop equals of climbing 28 stores. When the six covered outdoor escalators were assembled in 2011, the sweaty 30-minute climb was reduced to 5-minute escalator ride. What a massive improvement in life quality for more than 100 000 inhabitants – feel free to compare yourself! Our visit to Comuna 13 was blessed with scorching sun, so we opted to take the free ride. Yes, riding the outdoor escalators is totally free! The starting point of escalators offers a splendid view towards the hills filled with red-bricked houses, speckled with occasional bright walls. Comuna 13 is still one of the most densely populated – and poorest – neighborhoods in Medellin. At the base of the outdoor escalators, you can witness how small cement and brick houses are squeezed tightly together. At the top, the corrugated iron roofs showcase the slum-like architecture. 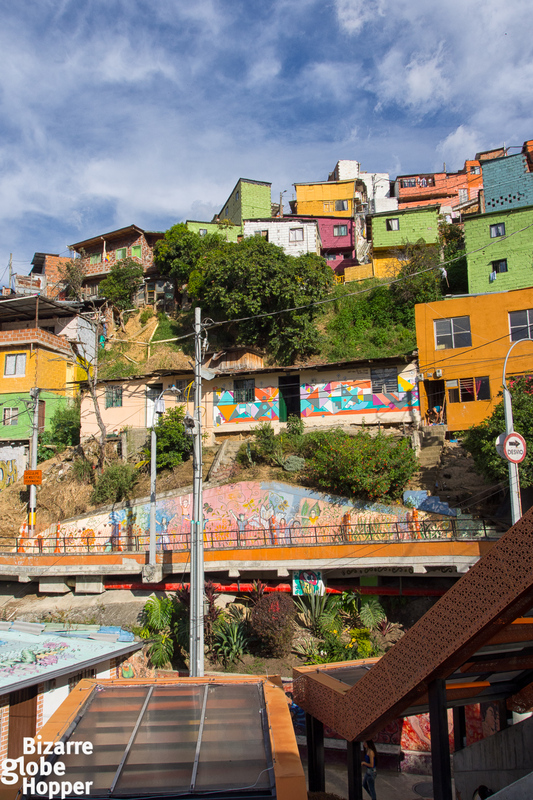 Some call Comuna 13 still a slum, but we saw it as a vibrant, quickly changing and creative neighborhood sparkling with hope and community spirit. When you hop on the escalators, quickly passing glimpses of homes and backyards melt together into one, colorful canvas. The old cement stairway mirrors the escalators, offering a real-life canvas for both budding and famous street artists – and entertainment for visitors. Bright paint, skillful murals, and omnipresent flower pots make Comuna 13 a cheerful place to visit. While changing escalators (or tramos aka sections), use the photo opportunities to capture changing views towards the center of Medellín– and upwards towards the hills. The landing areas offer splendid viewpoints of the surrounding street art, as well. The escalators ascent the slope for 384 meters, so naturally, the most breathtaking views await at the top. Pose with a city view, walk around, taste the local street food, or enjoy ice-cream. Stay awhile to observe the surroundings of Comuna 13 – that’s the reason for your visit, right? What else is on your route other than Comuna 13? Check the ultimate one-month itinerary in Colombia for inspiration on where to go after Medellin! Our route is divided into multiple one-week loops, so you can easily craft 1-6-week itineraries adjusted to your schedule and preferences. 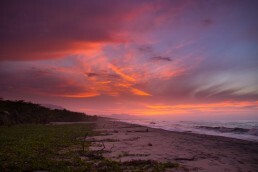 Learn how to book cheap internal flights in Colombia and get the bargain prices as a foreigner: check our flight hacks here. 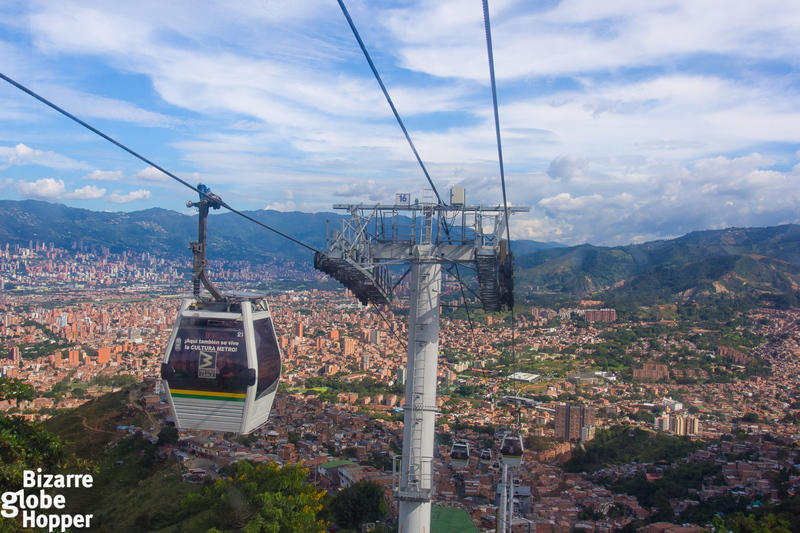 Good news: getting to Comuna 13 is pretty straightforward with Medellin’s public transport! The first step: take a metro from Medellin’s city center or Poblado to San Javier (metro line B). From there, you can take a bus or taxi to the Escalators of Comuna 13 (Escaleras electricas in Spanish) – or even walk. We chose to walk from San Javier to the escalators, as Google Maps showed the walking route and it was just 20-minute leisure walk (search Escalators Comuna 13 or Escaleras Electricas Comuna 13 in Google Maps (on Carrera 110). The starting point is located at the square/crossroads. If your map shows two destinations for the escalators, the other location marks the ending point. If you need to ask directions, just ask the way to Comuna Trece. A taxi trip from San Javier metro station to the base of Comuna 13’s escalators should cost the minimum (5000 pesos) or a little bit more, depending on your luck. Just wave down a taxi from the metro station. The bus stop is in front of San Javier metro station, on the opposite side of the street. The bus line is 255. The buses even have “Escaleras Electricas” signs in their windows, so it’s super easy to just hop in. Just ask locals if you don’t find the bus stop. The whole area around San Javier’s metro station is called Comuna 13, so feel free to explore deeper if you have time! Parque Biblioteca San Javier, a modern multi-level library and culture center, is well-worth of visiting and stands as a public sign of brighter future for the troubled area. The best add-on tour to your independent Comuna 13 tour is riding the metrocable of Medellin from San Javier to Aurora. You only need 1-2 hours more for the return trip with the cable car and a leisure walk around Aurora to spot even more street art. Be ready with your camera in the cable car, when you slide upon all the colorful barrios! Another exciting side adventure from San Javier is a paragliding. 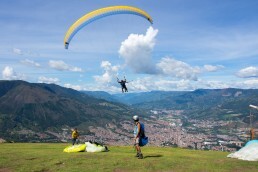 You can reach the best paragliding spot in Medellin easily with public transport from San Javier/Aurora. 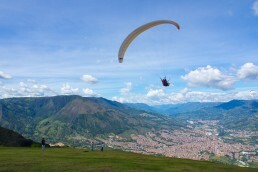 Check here our article for more juicy details on paragliding and stunning vistas of Medellin’s skyline! 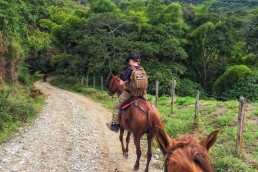 Medellin has a plethora of other things to do, as well. 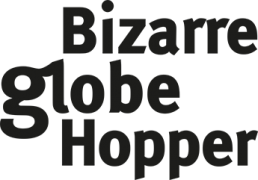 For example, you can take guided Pablo Escobar tours, visit museums, spot Botero statues, sip the world-famous Colombian coffee in hip cafes, and hunt down even more street art. We’ll compile our favorite urban adventures in another article very soon, so stay tuned. Is It Safe to Visit Comuna 13 and the Escalators? The area immediately around San Javier metro station is considered safe, as are the escalators of Comuna 13. There are several policemen stationed around the escalators. Nowadays, several tour groups visit the area during the daytime. 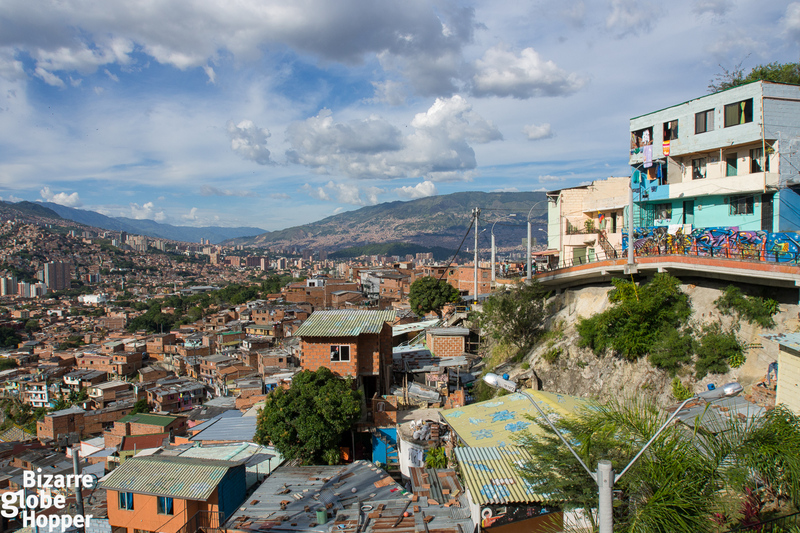 Although our hotel advised against visiting Comuna 13 independently, many locals claim it safe. Still, even locals advise against wandering too far from the escalators, where security guards patrol. Chat with the guards and ask their opinion before exploring the area outside the escalators. Don’t take unnecessary risks. Though our independent visit to Comuna 13 was safe and sound, I cannot guarantee that yours will be – please ask the current security situation from locals. If you are advised against going to Comuna 13 on your own, please consider taking a guided Comuna 13 tour (there are also private tours available). Please note that Medellin’s Comuna 13 is still low economic zone. 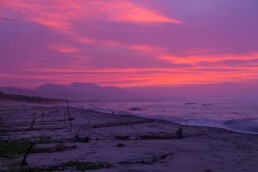 Visit the San Javier area only during daylight hours. Preferably, do not go alone to Comuna 13: take a guided tour if you don’t have company.  While homicide rates have sunk, street robberies are more than common. Watch your belongings and don’t carry expensive cameras or other valuables if you decide to wander further from San Javier metro station or the escalators of Comuna 13. Crime rates in San Javier and Comuna 13 have unfortunately risen during 2018. Already during spring 2018, media reported that criminal groups had become more active in San Javier area and some other comunas of Medellin, like neighboring Robledo. Thus, additional police officers are patrolling the streets of Medellin. On July 8th, four gang-related homicides were reported in Comuna 13, lifting the yearly murder rate to 44. Currently, more than 30 gangs operate in Comuna 13. Most of the gangs report to Oficina de Envigado, a drug cartel and criminal organization that used to be an enforcement wing of Pablo Escobar’s Medellín Cartel. Once again, community members claim that latest police operations in Comuna 13 haven’t been that legit, and there might, once again, be alliances between police and the gangs. Despite the nightly clashes and gunfights, Comuna 13 remains as a growing attraction for tourists interested in street art and urban renewal. Visiting Comuna 13 is still relatively safe during the day. Again, please ask locals the current security situation before planning your visit. Have you visited Medellin’s Comuna 13 and the escalators – or would you dare to explore the area around San Javier on your own? We just came back from Colombia and did the Communa 13 escalators independently with our 3 kids aged 3 and under. We felt safe the whole time! A definite must when in Medellin!